Michele Yang is a freelance violinist and Music Educator based in New York City. She has taught in public and private schools in NYC and worked on a kindergarten pilot string program in Central New York run by Julie Carr. Michele believes that teaching music to children isn't meant to create a professional musician; it's meant to enrich children's lives with culture, give them an outlet to express themselves, deepen their interest in other arts, and create a more well-rounded person along the way. Through music, children can better their reasoning skills, diversify their ability to communicate, and nurture their imaginations. Michele's goal is to cultivate all these concepts in her students, and inspire a love for music they can carry with them for the rest of their lives. 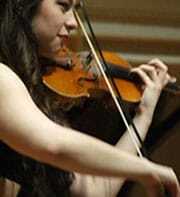 Michele studied violin with Maureen Yuen at SUNY Fredonia where she earned her Bachelor's degree in Music Education.